Radio is on fire right now. The last few days have been full of radio and podcasting excitement and I wanted to make sure you hadn’t missed out. I am also having an experiment with video. 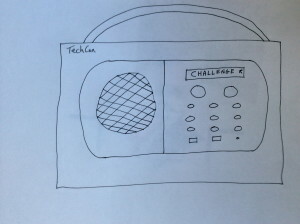 (I think we can all agree that I am better at radio – sorry for the wobbliness). As mentioned, Hirsty’s interview with Stephen Nolan on BBC 5Live is one of the interviews of the year. …talking of which, TechCon 2014 seemed to go very well. I was on social media duty and produced the round up session, complete with cheesy music. And if you are still in need of things to hear, then I recommend Helen and Olly’s Answer Me This! podcast. Helen and Olly are celebrating 300 episodes, so the format this week is a bit different (and full of famous voices). Warning: do not listen on the bus, as everyone will give you funny looks when you start snorting with laughter at random (not that I did that, obviously). Thanks for reading this far – please let me know what radio moments you are celebrating this week by leaving a comment at the bottom of this post. And whilst you are there, if you put your email address below, you can get email updates straight to your inbox (spam-free, naturally)! Hello, so this week, it’s all about celebration, and celebrating the radio industry. Over the last week or so there has been so much to celebrate in the radio industry and I wanted to give you a bit update and let you know some of my highlights over the last few days. So firstly I want to celebrate the fact that the radio industry, especially in the UK, is so inclusive and it’s a great place to share stories. Now I don’t know if you heard, there’s a broadcaster in the UK called Hirsty. And I first came across Hirsty a few weeks ago actually at the Next Radio conference, when he was speaking about his love of radio and the comedy inheritance that he’s had from different comedians over the years. So full of passion, so utterly amazing… obviously a brilliant broadcaster. And then, a few days ago, Simon Hirst did an interview with another radio legend, Stephen Nolan, who is an amazing interviewer, and during this interview, Simon revealed that actually, his whole life, he’s felt that he’s actually Stephanie, and that Stephanie would be making an appearance from now on. He was transitioning to become Stephanie. And the interview as a whole was just an absolute masterclass in how to listen, how to give space in an interview. It really shows how Hirsty is so comfortable in a studio. And it’s a wonderful example of how, when you give someone space, and you really listen to them, and you make them feel safe in a studio, they’ll really open up and give you the most amazing insights into their story. So I thoroughly recommend, if you haven’t heard it, that you check out the interview. I’m going to pop a link below. Secondly, another reason to celebrate, is that we’ve just had the Radio Festival in the UK. I have to admit that I have a little bias here, ‘cos I am involved with organising TechCon, which is the techncial day. We had a brilliant session. I’ll put a link to the highlights of it in the post below as well. So many things to take in. If you weren’t at TechCon – why weren’t you there?! Please come next year – we really do welcome people who’ve got production background as well as engineers. So many new things to learn, demonstrations of new technology, discussions of listening in cars and just the whole future of radio and what’s going on, so definitely something that I’m really proud to be a part of. And then the Festival as a whole was a fantastic time to celebrate. We got to hear from Hirsty again, in her first appearance as Stephanie in public. It was a packed house, the longest amount of applause out of any of the sessions. And I was just so proud that we have such a supportive industry. And everyone was just so pleased to see that she was so happy. We also had a very interesting session about mental health in media, something that I don’t think we talk about enough, from Mel Grieg (I hope that’s how you pronounce your surname, Mel), who was one of the DJs involved in a prank phone call in Australia last year. It was very interesting to hear her side of the story. And again, there’s nothing that can beat hearing a story straight from someone who’s in front of you, or that you are listening to on the radio, and being able to hear something first hand I think is very important. We also heard from Ben Cooper, on the things that keep him awake at night. One tip to give you is that he suggested to look at what children do, as that will give you an example of how technology is going to work in the future. And then, Richard Curtis, who has run Comic Relief for years and years and years, announced that he’s got a tiny little plan to get everyone in the world – so at least 7 billion people – to hear about the new version of the Millennium Development Goals that are going to be released by the United Nations next year. And he wants to get the radio industry involved in spreading that message. So that was a very exciting session, people came out buzzing with ideas for how they could get involved with that project technically, production-wise, there’s going to be so many things going on, so definitely check that out. 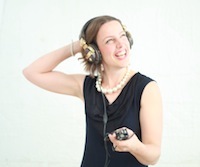 And then the third thing to celebrate is my fellow Sound Woman Helen …and Olly, who have a podcast called ‘Helen and Olly’s Answer Me This!’, have reached their 300th episode. Definitely worth having a listen to their podcast, it’s very funny, a little bit sweary. They answer questions from listeners – or they don’t answer questions from listeners some weeks. It’s completely worth it, if you haven’t got it on your podcast list you should definitely check it out. And I will pop a link to that below as well. So that’s what I’m celebrating in radio at the moment. How about you? What have you listened to recently that’s made you rush to your computer to show everyone the link? What is it you particularly enjoy about the industry that you are grateful for at the moment? Please let me know. I’d love to know what floats your boat and what you’re listening to. Just pop a link in the comments below. And if you liked this video, please give it a ‘like’ on YouTube and if you want to have more updates from me, please go to anncharles.tv, and sign up for updates and you’ll get all of the information straight to your inbox. Thanks very much for watching, and I’ll see you soon. Liked this post? Sign up for updates - It's FREE!